I’ve never been to Rikuzentakata before, and had never even heard of it before the disaster. It’s not the kind of place that many tourists would go to. I’ve been searching the internet for pictures of what it looked like before March 2011, and it’s been hard to find anything. Most of the pictures I came across (from after the disaster) show piles of rubble and in some pictures it was even possible to see hands sticking out of the debris. I don’t want to share those kinds of images here today because Rikuzentakata, like the rest of Tohoku, has had to focus on rebuilding and looking to the future. 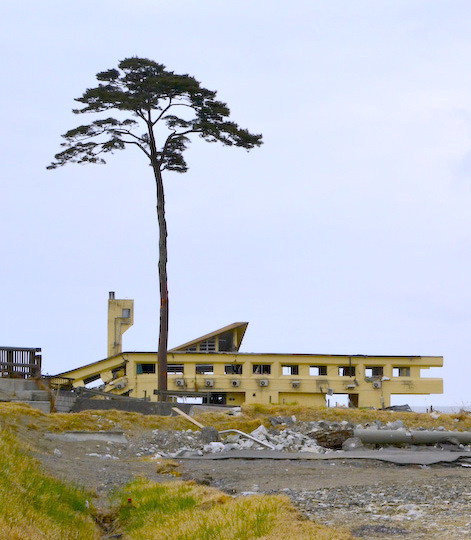 Although so much of Rikuzentakata was wiped out, something was left standing. 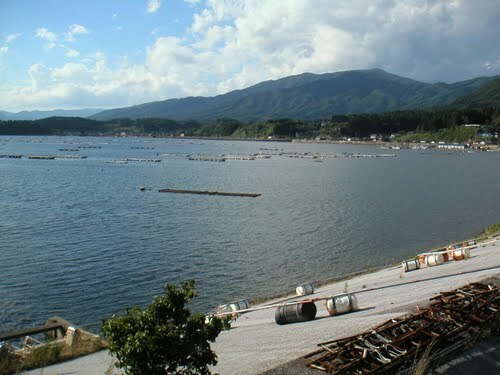 Before the tsunami, there were around 70,000 pine trees along the beach of Rikuzentakata. After the tsunami, just one remained. Standing as a symbol of strength against the disaster, the solitary pine tree has become known as “Ippon-matsu of Rikuzentakata” (陸前高田の一本松) and also as the “miracle pine” or “tree of hope”. A few days ago I read in the Japan Times that fundraising has begun to save the tree. Actually, the pine tree is no longer living (its roots have been rotted by seawater), but because of the “miracle” of its survival against the tsunami, funds are being sought to preserve it as a symbol of reconstruction. The article states that “At least ¥150 million [about £1.2 million] will be initially necessary to prevent the tree from rotting and to maintain its current conditions“. Donations can be made via Facebook, using a very easy-to-use application which accepts credit cards or PayPal. Municipal funds cannot be used to save the pine tree, so the “Miracle Tree Rescue Project” is calling on people around the world to contribute to preserve the pine tree using artificial means and maintain the surrounding environment. Rikuzentakata may have been practically wiped off the map by the tsunami, but it’s been firmly placed on my map of “places to visit” as I plan my trip to Tohoku (still not sure when I’ll be going, but perhaps in the summer of 2013). The Takata-Matsubara (高田松原) – the 2km stretch of shoreline that was lined with approximately 70,000 pines and selected in 1927 as one of the 100 Landscapes of Japan (Shōwa era) and in 1940 designated a Place of Scenic Beauty – may have been reduced to one solitary tree, but the spirit of survival is strong in Rikuzentakata, and I have a feeling people of Tohoku are going to keep fighting. I’ve been to some hit areas this year … and even a year later it still feels like the tsunami just hit yesterday. It’s so scary and sad to see. Thanks for reading! Have you posted about the places in Tohoku that you’ve been to? Great post again and a place that I will never forget. 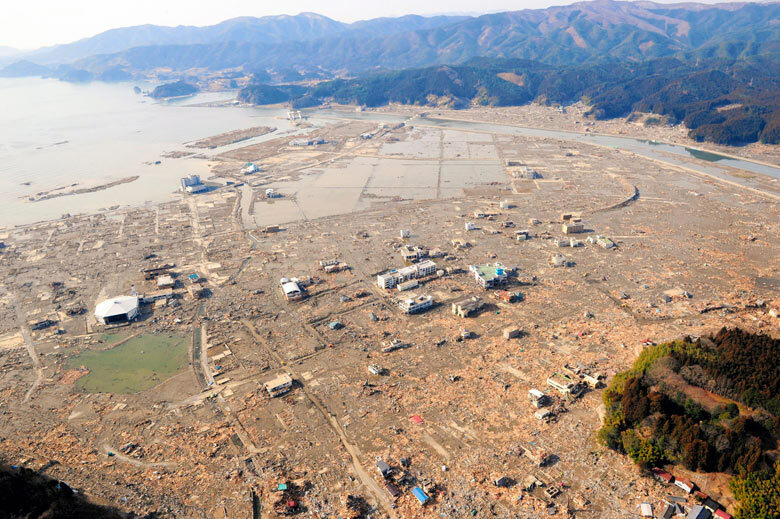 I didn’t know much about Rikuzentakata before the disaster, but have since heard so much about it. I can’t wait to see the Tohoku area for myself when I return to Japan next year. Some suggestions for next week include my favourite place in Japan Takayama, Takamatsu, Takahashi near Okayama, Tanuki, and Taue (planting rice). I’ll be interested to hear all about it when you go to Tohoku. When are you planning on going? I’m hoping I might be able to go next summer, but I need to save up first. I visited Rikuzen Takata last week, saw the pine tree. I went up to the Narita Temple from where the horrifying video of the tsunami was taken. So high above the coast, and yet just below the summit of the temple were some toppled stone monuments. After 3/11, one of my thoughts was, why did people rebuild along the coast after the 1933 tsunami? Well, now I know: there is no way anyone would have expected a tsunami to reach so far inland. – Also heard (and practiced flute for) the music played on the floats (dashi) at the Kenka Tanabata festival – I was there as a volunteer, helping to decorate one of the five floats. Last year only one float had survived, so the kenka – quarrel – involving floats ramming into each other could not be done. This year they did it. I am sure it’s on the internet. – Most of the large destroyed buildings in Rik Tak are still there, but will be removed. Not clear what will happen after that. Thank you for sharing your experience, David. I’d love to go there and see it for myself.